Oplev et marokkansk kryddermarked og højden af ​​hubbuben på Marrakesh centrale torv, Djemaa El Fna, på en 3,5 timers madtur. Med en mad-elskende guide, lære om Marokkos eksotiske krydderier og smag; se købere og sælgere prutte på et kødmarked; og prøve kulinariske specialiteter som fluffy Berber pandekager og ghoulal, en suppe lavet med snegle. Afslut med en autentisk marokkansk middag omgivet af de svimlende farver, lyde og seværdigheder i Djemaa El Fna. Numrene er begrænset til 12 for en mere personlig oplevelse. Et must-do for foodies! Bliv fanget i den sanselige overbelastning af Marrakech, da du vandrer sit mest berømte torv med en guide, der hjælper dig med at finde de skjulte perler midt i galskaben. Prøve fascinerende lokale specialiteter før afslutningen af ​​aftenen med en lækker traditionel middag. 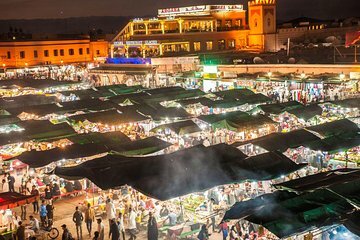 Start din marokkanske kulinariske eventyr, når du møder din vidende vejledning på Djemaa El Fna, hovedtorvet i Marrakechs medina, i tidlig aften. Hør en nedtælling af hvad der foregår, og tag dig tid til at absorbere det svimlende torv - erklæret et UNESCO World Heritage Site i 2001. Om aftenen tager Djemaa El Fna en livligere persona, da den fylder med smukt oplyste, varme madstande og folkemængder, der kommer her for deres natlige spadsereture og snacks. Vandre rundt på pladsen, og udforsk derefter nogle af sidegaderne for at opdage madstop, der ofte savnes af besøgende. Prøv nogle af de varer, der tilbydes, herunder nødder, oliven og andre specialiteter, og fortsæt med et fjerkræ og oksekødsmarked for at se lokalbefolkningen bytte af kød. Haggling er integreret i marokkansk liv, og når man ser på tilbudene, får man en fascinerende indsigt i lokal kultur. Deltager i et krydderi marked, som din guide fortæller hvordan Marokko var et vigtigt krydderi-handelscenter, og se de regnbuefarvede produkter såsom safran, paprika, kardemomme, anis og gurkemeje. Lær hvordan de er vant til at opleve tagines og andre hæfteklammer og gå på en travl souk. Pause for at prøve typiske marokkanske brød som msemen og beghrir - fluffy Berber pandekager - og hvis du ønsker det, prøv mere udfordrende delikatesser som fårehoved, kohoved eller snegelsuppe, kendt som ghoulal. Endelig besøg en restaurant på Djemma El Fna lige som aftenen når sin højde. Nyd et traditionelt marokkansk måltid med din gruppe, som du tager på pladsen med sine peddlers, slange charmers og entertainere. Din 3,5-timers madtur slutter efter dit måltid. Forlad din guide og vend tilbage til dit hotel eller fortsæt dit aften uafhængigt. The tour and the tour guide I think Abdul were great. There is a lot of food at the beginning and end of the tour, and some snaking on olives and sweets in between. Just remember not to take pictures of the adjoining shops, when you're trying the food of the place he's taken you, they don't like that. Highly recommend getting the tanjia for dinner, if you've had your share of tagines throughout your trip. Wow! 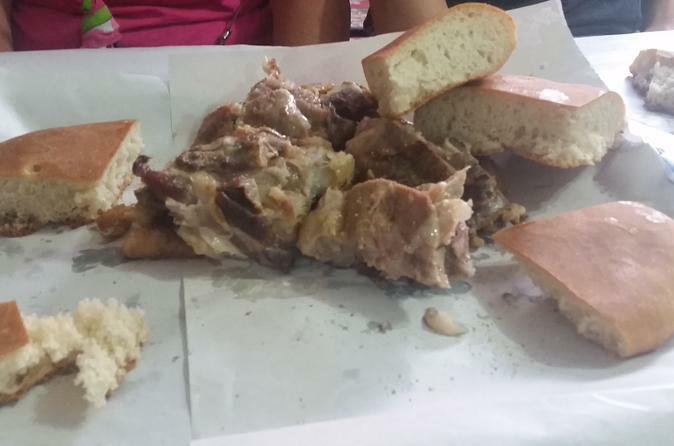 This tour was fantastic, what a great introduction to Marrakech food and culture. Our guide Youssef was friendly, knowledgeable and lots of fun. Do NOT eat before going on this tour - so much beautiful food to try. By the end of the evening we felt like locals! There was plenty of time afterwards to explore the markets and shops. The Tour Guide SALEM was very unprofessional and it was very bad value for money. I was the only person on this tour from the beginning. I will start from the beginning. From the first moments we started the tour late 15 minutes. Then when we started he kept on bumping into friends and having a chat. Then his friends called him on his phone and he kept on taking calls for 5 minutes while we were walking to the first place. The first place we went to this donut placed Morrocan pizza making which was interesting. He started asking me here how old I am and what I do for work and whether I was married. He told me I should have kids and asked me when do I want to have kids. this made me feel very uncomfortable.We then went to a spice place where he told I would receive some free Safron then when we got their the sales assistant said I would pay 500 derum for a gram. I did get to taste some nice tea. When I arrived inside they locked me In and my guide disappeared for a few minutes which I thought was unusual as I was locked into the shop. They did let me try some argon hand cream and different teas which was nice but then they did a hard sell. I think the guide is good friends with them. They were trying to get a good deal for both of them. They wanted me to try natural morroccan viagra. Actually insisted I try it. Thinking that I need it. I am early 30's and was quite offended. After declining making the saffron purchase they gave me a small gift of Argon Oil soap but kept wanting me to buy products. it was very hard to leave. I said I wanted to go now. we left quickly they were talking arrabic and laughing. Thinking it was hilarious. We then went to a sweet store which was interesting and then olive place. Didn't get to try much just a small handful. The olives were delicious thought the sweets not so much. Then we went to have Chicken Tangine which was delicious and a beef dish was at a tiny street kitchen I was expecting a restaraunt. A little disappointed by this. This filled me up though which improved my mood and I had a water too. All cost 50 deeruum which is about 4 pounds. He then continued to ask me about my personal life. We went to then a bread making place of traditional morocan bread where I was given hot bread to take with me. The guide then said Can't u hold the bread. You have woman hands. U need man hands that can handle bread. I put the bread in my bag it was straight out of the oven, Of course it was going to be hot. I was offended and found that very unprofessional which ruined that whole experience. Our last stop was a soup stop which the soup wasn't my cup of tea. So I just had a taste. We finished the tour here. 2 hours earlier. The tour was supposed to go from 6-10pm it finished at 8 pm. Each little visit to each stop apart from the main meal. The guide gave the shop 10 deerum which is about 80p British or 1.30 Australian dollars. So all up the tour cost the tour guide for what we did about 7 pounds, 12 Aud, or 10 American dollars. I paid 85 Australian Dollars for the tour . I would highly advise anyone to not to do this tour. I was really looking forward to this tour to finish off my holiday. He said If I liked I could give him a tip. and gave me his number and said if I come back to Marrakech to call me and wanted to have lunch with me the next day. I asked him why are we finishing 2 hours early. He said because I have worked all day and I am tired. I ended up giving him a tip because I felt sorry for him. Even though I was extremely disappointed. he escorted me to a taxi. But then here. I was shocked he got into my taxi and asked me to call him so he would have my number. I politely made an excuse saying I couldn't which I couldn't because I didn't have a morrocan SIM card. So he ended up getting a free taxi ride to the carpark from the souks. Overall I won't be coming back to Marrakech after this experience. Horrible customer service and not genuine. One good thing he did do was have some knowledge about what he was talking about each small talk went for 1 minute. I felt insecure. The Morrocan scenery, architecture, beautiful colours and souks have some beautiful items and delicious food. But I recommend looking the places urself and going to them urself. He walked very fast the whole time apart from when he bumped into his friends to chat. I then had to ask him what are you doing your working. If they fitted more souks to look at that would have been better too. I would advise not do book a tour like this if they don't give a detailed description of what type of souks and places you would visit and how many. Sorry to say all this I just think its important to know so you don't make the same mistake as me. Our guide was friendly and knowledgeable, and this was a great way to orient yourself in Djemaa El Fna. Learned about the history of Moroccan food, with sweet and savory bites, some fresh fruit, roasted lamb and of course, a delicious dinner. Highly recommend, especially if you plan to spend a few days in Marrakech.